A vast expanse of ice fringed with settlements, Greenland is a lure for adventure travelers—and at the heart of our global warming fears. The signs were subtle at first. The harbor, which used to reliably freeze solid, stayed ice-free one winter, and then the next. The coastal sea-ice routes, used by trucks to carry supplies to remote villages, began to melt. The nearby glacier quickened its retreat up the fjord. The tundra flowers bloomed early. And then, in a signal as unequivocal as the return of the geese in spring, came the ultimate evidence that global warming was serious business: incoming flocks of international journalists and politicians. "Last week we had the Danish prime minister and the president of the European Commission," Piitannguaq Pedersen, booking agent for the Hotel Arctic in Ilulissat, told me when I visited in June. "We’ve also had the BBC and the Washington Post." When it comes to climate change, Greenland is the front line. Climate scientists confirm what the locals have been saying for a decade: Greenland’s weather is getting warmer (by nearly 4 degrees in the last 15 years), and it’s wreaking monumental changes on the island’s icy environment. And that, perversely, has translated into a kind of celebrity. Movies like An Inconvenient Truth and books such as Elizabeth Kolbert’s Field Notes from a Catastrophe have given Greenland a star turn as the leading image of potential ecological disaster. Curiously, just as the world’s attention is fixed on Greenland and its receding ice cap, tourism here is taking off, rising by a full 10 percent in the past two years. In May, Air Greenland debuted its first-ever direct service from the United States, a twice-weekly, four-hour flight between Baltimore and the air hub of Kangerlussuaq, on the island’s west coast. The flight serves an ever growing number of adventure travelers in search of untouched locations to explore. And then there are the rubberneckers, driven by a morbid fascination with Greenland’s dangerous, melting beauty. I fell squarely into both camps. Within 24 hours of landing at Kangerlussuaq—a tiny settlement alongside a huge, decommissioned American airbase—I was bumping along the dirt road that leads to the edge of the ice sheet. The landscape was stark and comfortless, a series of bare, glacier-rounded hills softened by patches of tundra and a few musk oxen, shaggy goatlike beasts swathed in curtains of long, silky brown hair. The place seemed so indifferent to human existence that it felt almost extraterrestrial. Yet the last 4,000 years have brought at least eight waves of migration. The Norse, under Erik the Red, settled in 982 and scratched out a living for more than four centuries before vanishing. The Inuit, who last migrated from present-day Canada at about the same time, survived, and today their descendants account for 85 percent of the population. Many make their living as fishermen, living in small settlements scattered along the southwestern coast, in the narrow habitable band squeezed between the ocean and the vast ice cap. Four-fifths of the world’s largest island is covered by this ice, which is up to two miles thick and the size of Western Europe. At first glance, however, it’s rather unimpressive. After disembarking some 15 miles from Kangerlussuaq, I clambered over a tumbled gravel landscape and caught a glimpse of the fabled ice sheet: a field of dirty snow that stretched to a nearby ridge. I climbed higher, and at the top of an ice hillock I found the view I was looking for: an unearthly, rolling whiteness that stretched on and on and on—350 miles, to the island’s eastern edge. The only sound was the wind and the tinkling of rivulets of meltwater, seeping out of cracks in the ice and gathering themselves into a small stream. Kangerlussuaq overlapped with a visit by Dr. Dorthe Dahl-Jensen, one of Denmark’s leading ice physicists. Like most visiting scientists, she stopped by Kangerlussuaq International Science Support (KISS), a logistics hub housed on the edge of the airstrip. In April, KISS will be particularly busy, thanks to the latest International Polar Year, the fourth since 1882. During each of these periods, teams of scientists from around the world pool their resources to study a wide variety of arctic and antarctic phenomena. This "year" (it runs until March 2009), one of their focuses is on the impact of climate change. "I think that all scientists agree that global warming is man-made," Dahl-Jensen says. "The uncertainties in the discussion come when we predict what happens in the future." That’s where her research comes in. 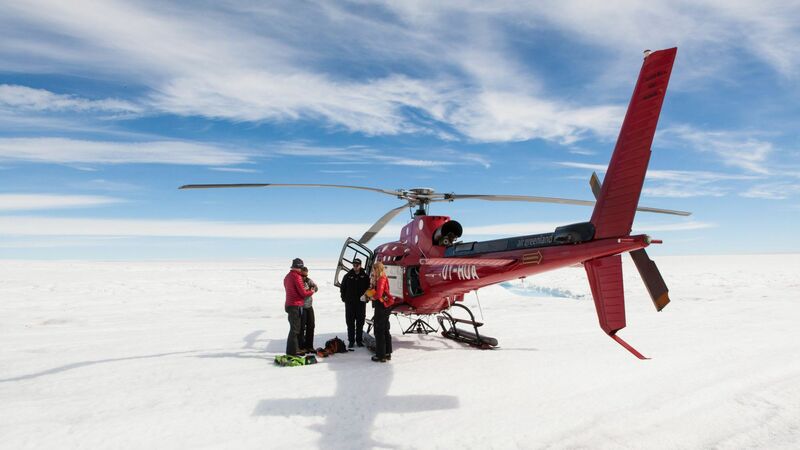 Dahl-Jensen is heading up a 14-nation project to extract some of the deepest, oldest ice from the bottom of the cap. "We want to drill an ice core that contains the unbroken record from the period 115,000 to 130,000 years ago," she says. "That’s a period when the average temperature over Greenland was nine degrees warmer than it is now." With our climate heating up, the core could indicate how much—and how quickly—the ice cap will melt in the decades ahead. According to current estimates, if the ice sheet reacts today the way it did then, Greenland will lose one-third of its ice. That process appears to be already under way. Models show that within this century, global sea levels could rise anywhere from seven inches to two feet, and some scientists say they could go even higher. And that may be just the beginning. Recent measurements indicate that Greenland is losing 200 billion tons of ice per year, a rate that’s twice as fast as that of a decade ago. If the whole thing melts (a catastrophic scenario that could take anywhere from a few hundred to a few thousand years, depending on whom you ask), scientists estimate that the worldwide sea level could rise 23 feet. So even if you don’t get to Greenland, sooner or later, Greenland may come to you. From kangerlussuaq, I flew north, my face pressed against the airplane window as I watched the empty landscape roll past. The uninhabited valleys of tundra, dotted with unfished lakes and cut by undammed streams, seemed a rugged and primeval Eden. In the summer sun, the land appeared benign, but the weather here is changeable and often unimaginably harsh, plunging in the long dark of winter to sub-zero temperatures for months at a stretch. We were already well into our descent when we skimmed over the Ilulissat Icefjord, a chaotic jumble of bergs and sea-ice rubble. This is where the ancient ice of the inland sheet flows out through a glacier and calves off into the ocean. Fifteen years ago, it moved at a rate of 3.5 miles per year, releasing enough fresh water to supply New York, New Jersey, and Rhode Island combined. Today, it’s flowing twice as fast. Just north of the ice fjord lies the town of Ilulissat ("icebergs," in Inuit), with a population that in Greenland makes it a megalopolis: 6,000, or a ninth of the island’s total population. For centuries, the town’s cold, fertile waters have spawned a rich harvest of halibut, seal, and whale. Now they draw travelers. Tour boats wind their way among the massive bergs that loom outside the harbor mouth, and carry passengers up to the Eqi glacier, whose calving creates mini-tsunamis with each falling chunk. Walk a mile south of town and you’ll find the cove of Sermermiut, near an Inuit settlement site hemmed in by an ever creeping palisade of icebergs. In Ilulissat, where a tidy collection of brightly painted houses sits upon barren outcroppings of gray rock, civilization at its most cultured resides alongside wilderness at its most raw and brutal. In the Pisifik department store, you’ll find the latest clothes and electronics flown in from Denmark, while down the street a sinewy hunter hacks a seal carcass into pieces for sale. But the town’s true heart is the harbor, home to its lifeblood, the fishing fleet. I wandered down, and asked a pair of Inuit fisherman if they had noticed a change in the weather. "We used to be able to dogsled to Disko Island, across 30 miles of sea ice," 56-year-old Daniel Jorgensen said. He spoke through a translator, in Greenlandic, an Inuit tongue. "We haven’t been able to do that since 1990." Nearby, hunters loaded plastic tubs with raw whale meat cut into cubes a foot across. Jorgensen agreed with all the other fishermen I talked to: Greenland has become indisputably warmer over the last decade or so. This has made it difficult to reach traditional ice-fishing sites by dogsled. On the other hand, it’s now possible to take boats out fishing year-round, and the reindeer herds, with more to feed on, are growing. So it has always been in the Arctic. One resource vanishes; another reveals itself. In nature, such change is constant. Only this time, the circumstances of this change are deeply unnatural. That night I went outside and climbed to the top of a rock outcropping on the shore. It was midnight and cold, the temperature a few degrees above freezing, but the sun was bright in the sky to the north. Mist hung over a scattering of icebergs, and the low-angled light gave them a mystical, otherworldly appearance. Further off lay a number of settlements, each smaller, and smaller still, until all that was left was the empty frozen expanse, and beyond, the North Pole. For one blissful moment, it seemed impossible to believe that any human could touch—let alone alter—this kingdom of ice. Jeff Wise is a Travel + Leisure contributing editor. Air Greenland inaugurated its twice-weekly service from Baltimore to Kangerlussuaq, Greenland’s air hub, in May. Daily flights link Kangerlussuaq with Ilulissat and other major towns. The airline also offers four different package tours (877/245-0739; airgreenland.com; three-night tours from $2,350 per person, including the round-trip flight from Baltimore and all transfers). Hotel Arctic Ilulissat; 299/944-153; hotel-arctic.gl; doubles from $270. Hotel Kangerlussuaq 299/841-180; airporthotels.gl; doubles from $240.